Within the Interface project we study the effect of management, namely livestock grazing and drainage condition, on carbon dynamics. One of the processes we are interested in is the decomposition. 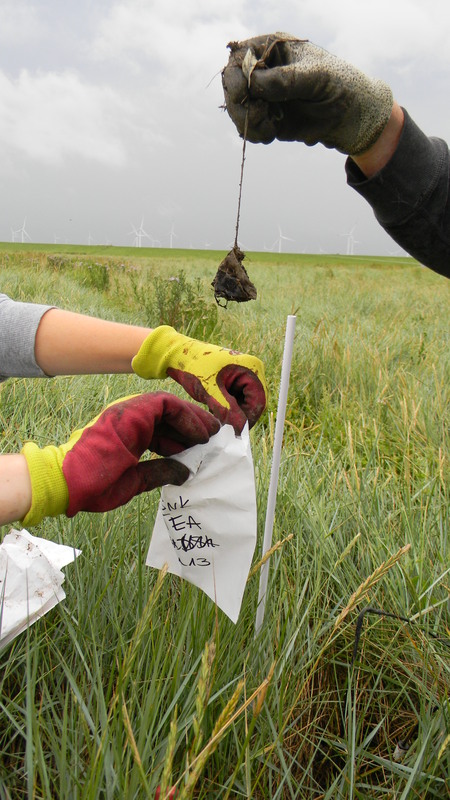 To study the composition we deployed litter bags, which were filled with dried plant material, in the marsh soil. However, we were also wondering how the decomposition rates we measure in our marsh would compare to those in other marshes e.g. in the US. Such comparisons, however, are difficult, because usually plant material from the marsh in question is used and therefore results should not be compared. The solution I stumbled over was an everyday object: a tea bag. Colleagues in The Netherlands used tea bags as standardized plant material and developed a method to compare decomposition rates across ecosystems, the so called tea bag index. We decided to use this method and asked colleagues worldwide to deploy tea bags in their salt marshes for us. We were very successful and found many volunteers. Somebody at the German local television station NDR heard about it and thought our tea bag study would be something interesting for them. So last week we had some visitors in the field equipped with camera and microphone.